OnePlus 6 launch is just around the corner as the Chinese phone maker prepares to unveil its next flagship on May 16 in London, followed by consecutive events in China and India the next day – i.e., – May 17. Earlier on Tuesday, special launch event invites for OnePlus fans went live and are now out of stock. Priced at Rs. 999, these invites included a OnePlus voucher worth Rs. 999, a Cash Cannon, a OnePlus Notebook, a Marvel Avengers cap, a OnePlus tote bag, and a Marvel Avengers t-shirt. Additionally, the OnePlus 6 has been spotted on Geekbench again – this time, the 8GB model has been listed. 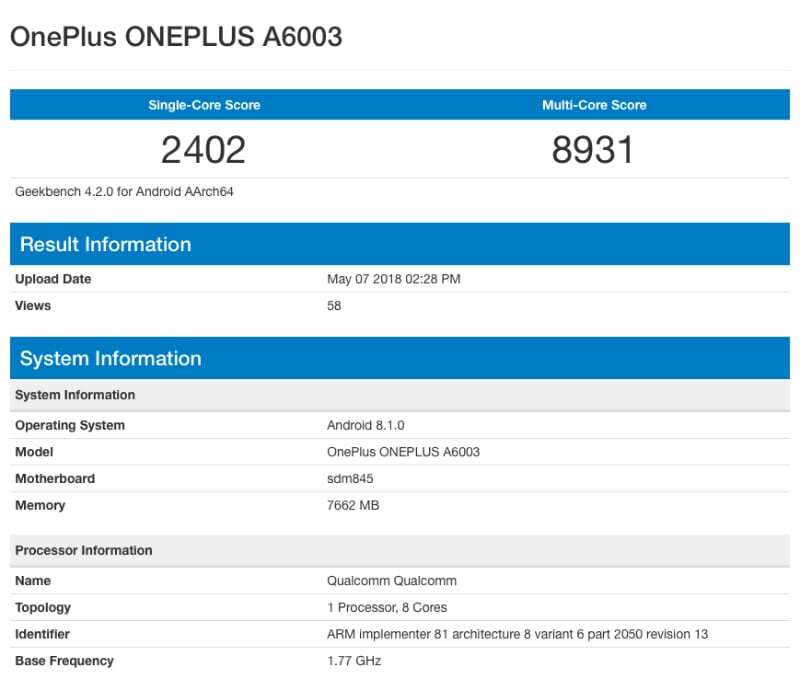 After an alleged sighting back in March this year, another variant of the OnePlus 6 has now been spotted on Geekbench with different scores. While the previous report showed us a single-core score of 2546 and multi-core score of 8672 for the 6GB RAM model, the newer one reveals a single-core score of 2402 and multi-core score of 8931 for the 8GB RAM model. OnePlus also claimed that over 1 million ‘Notify Me’ registrations were made on Amazon.in for the OnePlus 6. Launch event for the OnePlus 6 is set for May 17 at NSCI Dome in Mumbai. While OnePlus has confirmed a lot of specifications and features of the OnePlus 6, the latest developments come courtesy Amitabh Bachchan, Bollywood actor and brand ambassador of OnePlus. The actor, on his official Twitter account, has posted a selfie with OnePlus CEO, thought to be taken on the OnePlus 6. Earlier on Tuesday, Bachchan had posted an image that showed off Black and White colour variants of the upcoming smartphone. While the tweet – with the said image – has since been taken down, it was visible on Google Cache at press time. The deleted tweet showed Bachchan and Pete Lau using both variants of the phone and taking a selfie. The OnePlus 6 is rumoured to sport a 6.28-inch full-HD+ display with an 18:9 or 19:9 aspect ratio. The phone will be powered by a Qualcomm Snapdragon 845 flagship SoC, paired with 8GB of RAM and up to 256GB of onboard storage. It will possibly get a vertical dual rear camera setup with a 20-megapixel primary sensor and a 16-megapixel secondary sensor. On the front, it is expected to get a 16-megapixel selfie camera. Further, the OnePlus is said to be backed by a 3300mAh Dash Charge-compatible battery. Dimensions of the OnePlus 6 are rumoured at 155.7×75.4×7.8mm and it is said to weigh in at 177 grams.